Rooting from cuttings of a parent olive tree is the most popular method for olive tree propagation. According to Texas A&M University, climate is the most important limiting factor in olive tree propagation and production. Growth of olives trees will begin only after the temperature exceeds 70 degrees F. When temperatures fall below this point, growth and olive production ceases. Consult your local agricultural extension service to determine if your area is suitable for growing olive trees. Cut young stems from the parent olive tree with pruning shears. The stems should be approximately 8 inches long and the diameter of a pencil. The best time to take cuttings is August and September. Remove all lower leaves from the cutting. Dip the cut end into a mixture of Indole-3-butyric acid (IBA) at 4000 ppm in diluted alcohol for about five seconds. Treat the cut end with a commercial rooting hormone by dipping the cut end into the white powder. Mix together equal parts peat, perlite or vermiculite, and sand. Treat the soil mixture with a fungicide to reduce fungus growth to the olive cutting. Fill a 6-inch pot that has drainage holes in the bottom with the soil mixture. Place the cuttings in the pot, equally spaced. Up to five cuttings or six cuttings may be inserted into each 6-inch pot. Keep the cuttings moist by misting with a spray bottle or mister. Allow the water to drip from the cuttings into the soil mix. Roots should begin to form within six to eight weeks. Re-pot the cuttings into individual pots after 10 to 12 weeks. Fertilize the cuttings with a water-soluble fertilizer. The olive seedlings may be planted the following spring. Choose a site that is well drained with full sun. 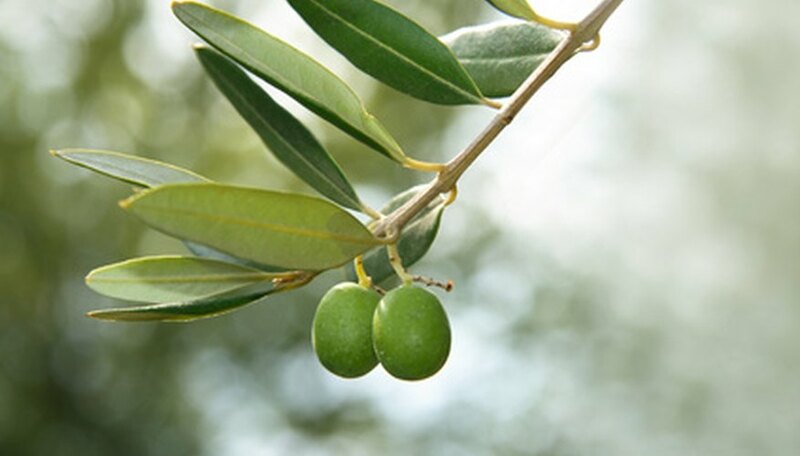 While olive trees are drought tolerant, the plant will respond to watering. Do not overwater the olive tree excessively, as the roots tend to get water logged.